MAHARATNA oil major Oil and Natural Gas Corporation (ONGC) has received environmental clearance for drilling five wells to explore shale gas and oil in the KG basin of Andhra Pradesh at an estimated cost of Rs 217 crore. The current production of oil and gas is 750-800 tonnes per day and 2.5-3 million cubic metres of gas, respectively, from various facilities in this area. As the KG basin holds significant promise for additional reserve accretion, the petroleum ministry is keen on continuing the exploratory activity. Against this backdrop, the ONGC proposal for further exploration of shale gas and oil in the KG basin was examined by the environment ministry. "The proposal was first vetted by the expert appraisal committee. Based on its recommendation, the environment ministry has given the final environment clearance to ONGC for exploratory drilling of five wells in the KG Basin," a senior government official said. The approval has been given subject to certain conditions, the official noted. According to the proposal, the ONGC plans to drill wells in the on-land PML blocks in West Godavari, Bantumilli extension, Suryaraopeta, Mahadevapatnam and Mandapeta in Krishna, West Godavari and East Godavari districts to assess the hydrocarbon potential of shale. The project is estimated to cost Rs 217 crore. About 5-6 acres of land to drill each well will be required and the duration of drilling will be 90-120 days per well. All these wells will be drilled with water-base mud only, it added. The exploratory wells are drilled to assess presence of shale gas, which also provide leads for initiating further exploration programmes to exploit huge potential of shale gas resources for ensuring energy security of the country. India's known oil and gas reserves form a mere 0.8 per cent of the world reserves of petroleum. 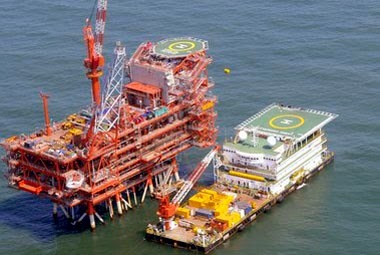 ONGC is the largest producer of oil and gas in the country, contributing 72.4 per cent of the crude oil and 48.5 per cent of the natural gas production. At present, over 78 per cent of India's oil requirements are being met through imports.